The 13,300-square-foot SCADshow features three stages with a total of 635 seats. 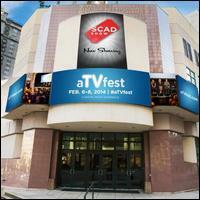 Built in 1986 as the Academy Theater, SCADshow serves as home to aTVfest and other SCAD Atlanta events. The main stage has a 375-seat capacity, and two black box theaters include 185 and 75 seats. Parking: Parking is available in nearby lots. MARTA: Take the Red/Gold Line to the Arts Center station. Exit east onto 15th Street. Turn right onto Peachtree Road, then turn left onto 14th Street. The venue will be on the right.